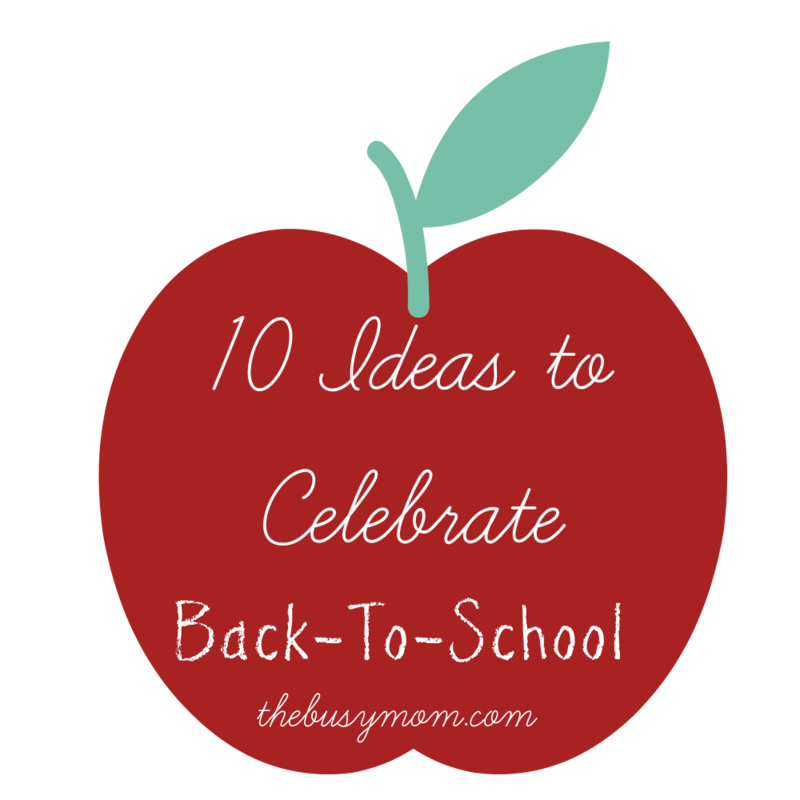 10 Ideas For Celebrating Back To School! Can you believe it is that time of year? Again? Here in East Tennessee kids are headed back to school the first full week of August! Yikes! What about you? Are you gearing up for another homeschool year? Kids getting ready to head back in your area also? I am one of those moms that loves to celebrate EVERYTHING! I love a reason for cupcakes or balloons. Don’t get me wrong, my simple celebrations aren’t always Pinterest-perfect, but celebrations don’t have to be! Adding one of these simple ideas sometime the week before school starts will help to create some positive, wonderful memories for your family as you start a new school year! 1. Snap a few special pictures. Use this list to make sure you don’t miss any special back-to-school moments. I love these sidewalk shots using chalk to write their grade level. 2. Bake a fun treat together. (Or one to take to your new teacher and classmates!) Try these adorable apple-cinnamon back-to-school cupcakes! And here are a few healthier options like fruit kabobs and apple sandwiches or these adorable cheese stick pencils! 3. Read a sweet book together. Here are a few back-to-school picture books to share with your kids: My Brave Year of Firsts by Jamie Lee Curtis, Chopsticks by Amy Rosenthal, Miss Bindergarten Gets Ready for Kindergarten by Joseph Slate, How Do Dinosaurs Go To School? by Jane Yolen. 4. Have a good-bye to summer party. Have one last hooray! One last sleepover, one last visit to the water park, invite friends over, etc. Making it a “last time” possibly in the week before school starts could seem a bit sad, but I think it’s just making it more special and making memories. Focus on the positive. 5. Make a gift for the new teacher. Even if that teacher is YOU. I like gifts, don’t you? 🙂 What about a pencil vase/jar made out of crayons? This ruler crate/basket is adorable. This pencil wreath would be a perfect back-to-school gift for a new teacher! Or, if the teacher is you, a pedicure or gift card to Starbucks may be more to your liking! 6. Go back to school shopping. Even if you don’t leave your house to school, a new outfit or a new pack of crayons is always exciting! 7. Fill out an interview with each child, an “all about me” type questionnaire that makes a great keepsake. Here is a great printable interview already made for you. Scroll down on this post for another colorful interview printable. 8. Print a few lunchbox notes to encourage your kids throughout the year. You can always place these notes at their place at the table if you’re at home, or on their pillow! I think if I print some out ahead of time I might be more inclined to use them through the year. Here are a few printable notes you can give to your kids! And a few more for you to choose from. 10. Pray together. Pray for your students, their teachers, their friends, their school, our country. Pray that our families can be a light to the world in whatever school setting they attend. Have a great school year, Busy Moms!! Find more from Candace in her Author Box below! Thanks for the great ideas. I even like the word “Celebrating the New School Year”. I’m a teacher, and I’m going to use that term with students. I feel so encouraged by your words; I needed that today. These are great ideas! We aren’t starting school until September 2nd, but we are going to start doing some of these things soon!